Here you’ll find familiar recordings by Chuck Berry, Johnny Tillotson, Duane Eddy, Eddie Cochran, the Ventures, the Coasters and Johnny Burnette, but look more closely and you’ll find lesser-known records from the Delicates, whose members we now know more about than ever we knew in 1960, Teddy Redell with a track that’ll set you back £50 or £60 pounds now and Sonny Burgess, a wild rock‘n’roller who hadn’t noticed America’s chart was full of boy next door love songs in 1960. Here too, you’ll find Vernon Taylor’s sought-after version of Elvis’s ‘Mystery Train’, and even a good-time country sound from Wynn Stewart which London chose to only manufacture in Britain as an export item. 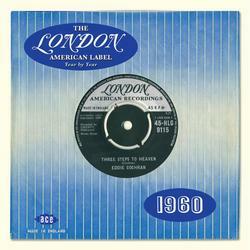 The London American Label Year By Year and start re-living the sound of 1960.